Apple’s recent Mac OS X Lion release shows how the Mac and iOS platforms are increasingly overlapping. And third-parties are beginning to follow Apple’s platform-blurring lead: On Tuesday, Iomega rolled out an external hard drive that also features a charging port designed for Apple’s mobile devices. The Iomega Mac Companion Hard Drive comes in two sizes—2TB and 3TB. The 7200-rpm drive comes in a compact design, which Iomega says can tuck neatly into the base of an iMac or Apple display. More significant for Mac owners who also use Apple’s iOS devices, though, the new hard drive includes a USB charging port. Users will be able to plug their iPhone, iPad, or iPod touch into the Mac Companion Drive to recharge the batteries on those mobile devices whenever they’re back at their desktop. It isn’t hard to figure out why Iomega decided to include a charging port with its new hard drive. The drive maker points out that Apple sold more than 9 million iPads during its fiscal third quarter; in that same three-month period, iPhone sales topped 20 million. Combine that with Apple’s record third-quarter Mac sales, and that’s a lot of people who own all sorts of Cupertino-designed gadgetry. In all, the Mac Companion Hard Drive offers two FireWire 800 ports, a USB 2.0 port, and a two-port integrated USB 2.0 hub. That latter connection means that users can connect printers, other external hard drives, or other devices to Iomega’s new offering. The Mac Companion Hard Drive ships with three cables—one for FireWire 800, another for USB 2.0, and a FireWire 400-to-800 conversion cable. The drive also sports a capacity indicator gauge—basically a set of four LEDs—that will give users an idea of how much space they have left on the Mac Companion Hard Drive. Four white LEDs mean that less than 20 percent of the capacity is in use, for example, while a single red LED indicates that more than 80 percent of the storage space has been used up. Iomega’s Mac Companion Hard Drive starts at $195 for the 2TB model; the 3TB version costs $295. 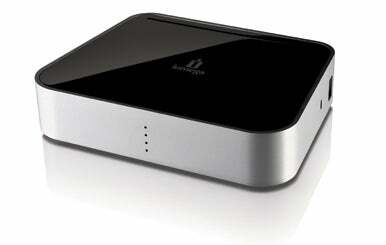 The drive includes Iomega’s QuickProtect file-level backup software and 2GB of free online backup through Mozy. The drive is initially available through Apple’s online store and retail outlets, though Iomega plans to expand sales to other stores and sites later in August.